Just a quick post to mark my 4 yr anniversary!! Achilles gate was a battle and a half, laced with a journey of mental self discovery and many milestones. 4 yrs on and other than a very slightly weaker leg I have no lasting issues from the rupture. I have cycled thousands of miles, run hundreds and skied for days……..there is not one thing that I have not managed to get back to, so you see there is light at the end of the tunnel! For those of you at the start of the journey, yes there will be dark, frustrating days but be positive, challenge yourself in other ways and everything will eventually fall or rather heal back into place. Over and out - Pegleg. One year on since Achilles Gate! Well here I am, one year on from my total ATR and I can honestly say that I never dreamt I would be back to doing all what I am plus more!!! To celebrate my husband and I went for a three day cycle tour of the Scottish North West coast, covering over 180miles in three days 3rd - 6th May and the good and most amazing news is that I both never thought of my Achilles or ever felt it, even going up the steep hills - WOW. I then had one day off on our return and went to my class again today (yes the very class where I originally got my injury) and manage it full on, so one can safely say I AM TOTALLY BACK and am appreciating every step and movement I take. I do work hard at my fitness and I do religiously do my stretches, but the strength has returned to my calf through the mixture of cross fit training, running and cycling. It is still ever so slightly smaller and the join is still thick but to be honest I don’t think it is noticeable. I do occasionally read some blogs and can still remember the pain, frustration and terror some of you are experiencing, but please take it from me that it does get better and there really does come a day when your Achilles is no longer a part your daily life. I know it is hard to imagine or believe but I honestly now find myself in a place where I am stronger, fitter and more determined than I was pre ATR so that can only be a good thing. I wish you all good healing and stay strong. 10 Months and my Mojo is completely back!!! It’s been quite a while since I last posted, but for all the right reasons - life is back to full steam ahead……. what ATR???!!!! It’s all a distant memory now! I returned to the class in which I did my ATR (just before the 9th month mark), admittedly it was attended with trepidation but I soon realised that my ‘bad leg’ was no longer bad and that it was now good so all classes are tackled head on now and to my full capability. It has been very much onwards and upwards, last Sunday (one day off my 10 month mark) I ran my very first organised race and to my delight I completed it in my pre ATR time. This was my aim, but to actually achieve it was an amazing feeling. I still find my Achilles feels much better if I excersise everyday, it definately seizes up a bit if I sit around so keeping active is my daily aim. I have no regrets of having surgery and perhaps more interestingly no regrets from even getting an ATR, I still firmly believe it has made me stronger not just physically but mentally too and I have a renewed appreciation for things. So my leg is good and life is great. It proves that you do recover and life does get back to normal even though at times it feels like you are not. Happy healing - take it steadily, and sensibly then most things can be achieved. 7 month mark and it’s all systems go!!! Haven’t been on here for ages, so I hope everyone is making good progress and for those very new to here, hang on in there, it’s tough but it DOES get better. Well what can I say…..I have now basically forgotten about my ATR - I am back to full steam ahead and basically living my life as I did before ATR, that is except for the daily heel raises! I am back to all sport, still running slightly slower than before but I am working on that, I have started doing plyometrics so hopefully this will reinstate the remaining lack of strength/power. My calve size is still increasing gradually and now has good definition and shape, the actual repair site is still slightly thickened but is much better than I dared hope for. I have been given the go ahead to train for some road races early next year so I look forward to following a training programme for those. Happy healing and I wish you all a Merry Christmas. Nearly at my Six month mark!! Went to see my physio this week and she is very happy with my progress, so much so that she has announced that she can do no more for me and is basically signing me off her priority list!! She is most impressed with my commitment and drive to beat this injury and believes my dedication to all the exercises etc has paid off. It’s not all perfect, in fact far from it - I still lack explosive strength and still struggle to do multiple heel raises (off the edge of a step) using my ATR leg but my PT says that time and continued exercise is the only answer for this and to be honest I agree. 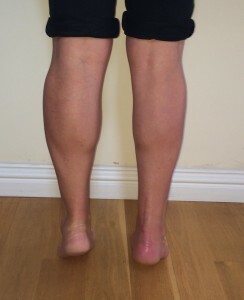 I am keeping away from the high impact exercises until my strength has improved a little more, (probably once I can stop my heel from dropping when I land on my tip toes) I don’t think there is any point on adding stress to my achilles when it is obviously not quite ready! I am however managing spinning, light jogging and now boxercise, so can do plenty to keep me ‘on my toes’!!! So generally it’s all good, I feel very fortunate that I have been blessed with a relatively straight forward recovery thus far. I also hope it gives extra confidence to those who were not on a fast protocol, I was NWB in a cast for first 6 weeks then went straight into FWB in the boot there after, I did have a lot of muscle waste and did have to grit my teeth and push through discomfort etc but I look back now and think it was well worth it!! I am a couple weeks off my six month mark and find myself amazed that I have achieved a lot more than I had ever thought I would have by this stage, other than the scar (which is neat) and a slightly smaller calf you would never know that I had been on such a testing and character building journey!!! So here I am now able to run on the treadmill for 5 - 10mins with good form, my PT doesn’t want me to do more than this for now to avoid tiring my foot/leg which leads to slapping - I can live with that. On Monday I completed my spinning class having done everything to the full, yay I can now stand comfortably when required so next step is to turn up the resistance. Yesterday at PT, I was introduced to the Bosu Ball - doing step ups, lunges and single leg balancing, I can really feel how my balance is being challenged further and how all my muscles are being forced into working….. brilliant!!! The exercise I have have to work at most is the good old simple heel/calf raise, I still don’t have good strength standing on my bad leg when fully up on my top toes, I just seem to cave in when past a certain height. So it’s double raises transferring onto bad leg to go down, so simple but ridiculously hard and frustrating, grrrrrrr. The definition in my calf is rapidly improving but as before still smaller than other leg. With referrence to achilles scars, mine is also thicker/keloid at the bottom but have been told this is caused by how they tie off the stitches, seemingly this is where the finishing knots would have been. My trainers also rub the very bottom of the scar which does irritate it but nothing too major, the OS told me that this would eventually reduce over time. Out of curiosity has anyone gone done the accupuncture route? I was speaking to a fellow gym goer this morning and they said that they found this to be very benifical even though at first they didn’t believe in accupuncture. More food for thought. 19 weeks and continued progress. Things are thankfully still progressing well and at a reasonable pace. I can now follow my spinning class at the same rpm and with high resistance as the rest of the participants, the only area I now need to improve with regards to spinning is the amount of standing time I can do. I still have not been given the all clear to run properly (as in trails etc), I can do short jogs with a shortened slow stride buts that is it, as when I increase speed I go very flat footed on the injured side. To help improve this my physio has now introduced me to small single leg squat jumps, heel drops and raises off a step plus reasonably fast stepping on and off a step on my tip toes, I am to do these with emphasis along with all the other ‘easier’ things. As for appearance, my ankle/achilles is most definitely remoulding nicely, it has a more defined shape and the achilles its self has a lot more manuoverabilty when being manipulated. My calf shows the two muscle heads well now but the size is still way off normal. As time progresses I don’t really think about the injury nearly so much - hence the lack of posting here. I find that the fears and frustrations have more or less gone and now the determination of regaining improved fitness and strength is predominant in my thoughts. That doesn’t mean I don’t think about you other ATR’s because I do - a lot, I really hope that you all are making good progress and always remember to look back and see just how far you have come since the dreaded ‘pop’ and the all the ups and downs it brings with it. Even when we take three steps forward and two back we are still making progress towards that finishing line of the Achilles Marathon! Wishing you all good progress. I am writing this to state as many have stated before ‘Time and effort really are great healers’. So her I am feeling rather pleased with myself, since my last post things have come A LONG WAY! I have now been completely signed off from my OS and hospital as they couldn’t believe how well I looked and normal I could walk etc. The lump of the repaired achilles and the actual scar are improving everyday and most of all I hardy get any pain or swelling anymore. I have completed 1hr spinning classes, holding a good steady RPM with resistance but have not done any standing time on the bike so guess that is my next aim. PT is also going well and proving to be very worthwhile. It is interesting speaking to people in the gym who enquire how your are doing. Many just stare in horror at the scar and say ‘ I don’t think I could cope’ - my reply is the same every time, I tell them how you are faced with two choices :- either give in to it all, sit around, feel sorry for yourself and stop living OR bite the bullet, grit your teeth and fight to get life back as you know and live it! It is amazing how with the power of the mind you can fight through the difficulties, many frustrations and suddenly find that you have started to exceed your own initial expectations and then that’s when your fire is lighted even more and the desire to come back fitter and better than before becomes the driving force. Hang in there newbies to ATR and those who are struggling, yes it is hard, painful, frustrating etc but it DOES get better and the bad times start to fade from memory and the achievements start to replace them. Happy, healthy healing to you all. Progress being made all the time! Look no wobble but along way to go to get all the muscle back! This weeks report is that I have started swimming again, it feels great to be exerting myself. The breast stoke is my favoured stroke for now as I find that front crawl aggravates the flexion in my foot. I also went kayaking down a local river yesterday, whilst it was great to be out on the water, I did feel rather vulnerable so was very cautious about any white water and tried to avoid it at all costs! Walking is improving on a daily basis, I am just about back to my old fast pace and the bonus is with no limp! Yes I do still get bad days, but they are when I have simply done too much so the old ankle tells me to stop and rest so that’s exactly what I do! So that’s this week, hope everyone else is making progress, no matter how slow, keep your chin up because at least you are moving forward!!! Things going well, walking without a limp for most of the day although quality of gait does decline as the day goes on (depending on what I have been doing). Still icing 3 x a day and sometimes elevating the ankle when seated to keep the swelling at bay. Saw the PT again yesterday, she was pleased to see that I had reduced the temp in my ankle and that my dorsiflexaion has further improved, so she pushed me a bit further. I did a great set of exercises on the Reformer followed by the ‘rocking and wobble boards’ finished off with heel raises and gentle calf stretches. Have ordered my own wobble board to continue improving my balance and lower leg strength at home and I am going to try and swim as much as possible to try and start improving my cardio fitness as I HATE not feeling on top form. So all in all everything good, as everyone else say’s progress is frustratingly slow but it is the nature of achilles recovery so we just need focus and get on with it. pegleg has completed the grueling 26.2 ATR miles to full recovery! cardiojunkie on One year on since Achilles Gate! Herewegoagain on One year on since Achilles Gate! skelonas on 10 Months and my Mojo is completely back!!! Pegleg on 10 Months and my Mojo is completely back!!! Jeff on 10 Months and my Mojo is completely back!!! Powered by WordPress MU & designed by Phu Ly.